It’s the first week in February and for those who are still going strong with their New Years resolution to get fit, you’ve proven yourself to be in it for the long-haul. 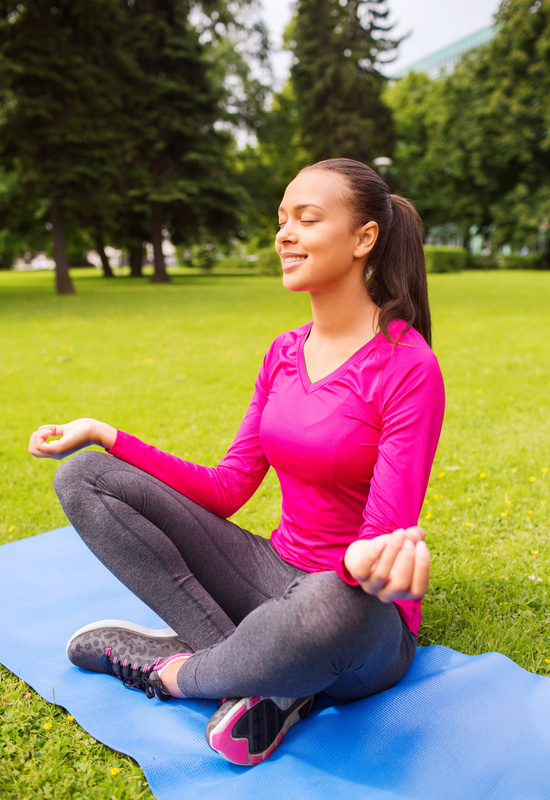 For those looking to grow your hair and get fit, Yoga may be a great option to explore. Yoga in Hinduism is a set of mental and physical exercises aimed at producing spiritual enlightenment. Yoga has been said to be highly capable treatment for many hair and scalp issues. Poses that particularly work well are inversion yoga poses, which are poses that require your head to be below your heart. The premise of the inversion method is that the upside-down poses bring a rush of blood to the head, which nourishes the roots with extra circulation thereby stimulating hair growth. Some reviewers claimed to have a quarter-inch to an inch or more of new growth in just one week. Below are some of the best inversion poses for hair growth. Downward dog pose, provides good circulation to the head and is also good for sinus, common cold, stress, mental fatigue, depression and insomnia. Simply, stand on the mat with the feet flat. Keep the hands on either side of the body while facing the palms towards the thighs. Bring the body downwards slowly, while bringing the palms to the ground. Tuck your tummy in and inhale deeply. Hold this position for a minute and come back to the earlier position while exhaling. Camel pose is excellent for rejuvenating the hair blood cells. To perform this pose, sit on your knees on a mat and keep the hands on the waist with the thumbs behind. Lift up your body and hold the feet with your hands. Hold the position for thirty seconds for best results. In additional to stimulating blood flow to the scalp, standing forward pose, helps in reducing fatigue, tiredness, menopause systems and also improves digestion. It also de-stresses you and relieves you of anxiety and tensions which is a primary reason for hair loss for many people. To perform this pose, stand straight with your legs close to one another touching your knees, heels, feet and toes. Inhale deeply. Now while exhaling, lift up your hands and bend forward, until your hands touch the floor. If possible, you can also bring your hands behind your heels. If you can’t touch the floor or your heels, hold on to your elbows as you bend forward. Breathe normally and hold on this position for 30 seconds. If these poses are too advanced for you, you can sit in a chair and bend forward toward your knees. Or you can lay on a bed and hang your head over the edge. Yogi’s say you should hold an inversion yoga pose for four minutes a day, every day for one week. It’s recommended that you only do this one week per month because your scalp can get used to the extra blood flow and stop growing hair at a faster rate. Another Yoga method is Balayam, which consist of rubbing your nails together. By doing this, the roots of the hair follicles connected to the fingernails pump energy to the scalp needed for hair growth. Besides hair loss, Balayam yoga can also cure dandruff and premature graying of hair. 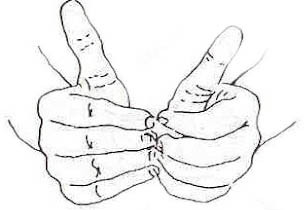 Curl the fingers of both hands inwards towards your palm. Bring the nails of both your hands in contact with each other and start rubbing them vigorously ensure leaving out the thumbnails (the thumbnails has been known to grow facial hair). Keep rubbing your nails continuously for 5-10 minutes at a stretch. Have you ever tried yoga for hair growth? Posted on February 3, 2015, in Natural Hair and tagged Hair Growth, Inversion Method, Yoga. Bookmark the permalink. 3 Comments. I just sent this post to my friend because when he started doing yoga he was depressed and his scalp was peeling really bad–you could call it stress dandruff. Since starting yoga, his skin has stopped peeling on his head and his fight with depression is on the up. Thanks for sharing this post because I really do believe that yoga benefits us in many unpredictable ways! Thanks for sharing @Dash! If your friend is experiencing hair loss due to stress, meditation is also something very beneficial. You can’t imagine how 10 minutes of relaxation and silence everyday can change your life for the better! It was a good share. It’s weird how easy meditation seems until you try to find time in your day to do it. Worth it, I’m sure. Thanks again for the words!